Dr. Karen Kwei, MD provides comprehensive women’s health care services at Bayard Street Obstetrics & Gynecology in New York City. She is a compassionate OB/GYN affiliated with New York Presbyterian Hospital Lower Manhattan, where she regularly performs vaginal and Cesarean deliveries and gynecologic surgeries. 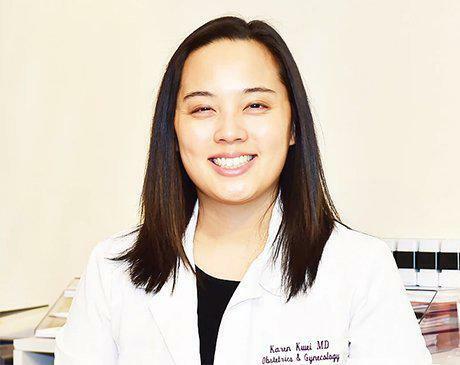 Dr. Kwei received her medical degree from the Boston University School of Medicine and her Obstetrics and Gynecology residency training at Dartmouth College Geisel School of Medicine. Her research on umbilical cord blood banking received an award from the Japan Society of Obstetrics and Gynecology. While attending Brown University for her Bachelor of Science degree, her Hepatitis B research generated four national journal publications. Trilingual, Dr. Kwei speaks English, Chinese, and French. Her medical services cover pregnancy care, abnormal Pap smears, breast screening, menstrual irregularities, ovarian cysts, contraception, and family planning. Dr. Kwei is accepting new patients. Call the office to schedule an appointment.